Bring a flashlight (no headlamps). 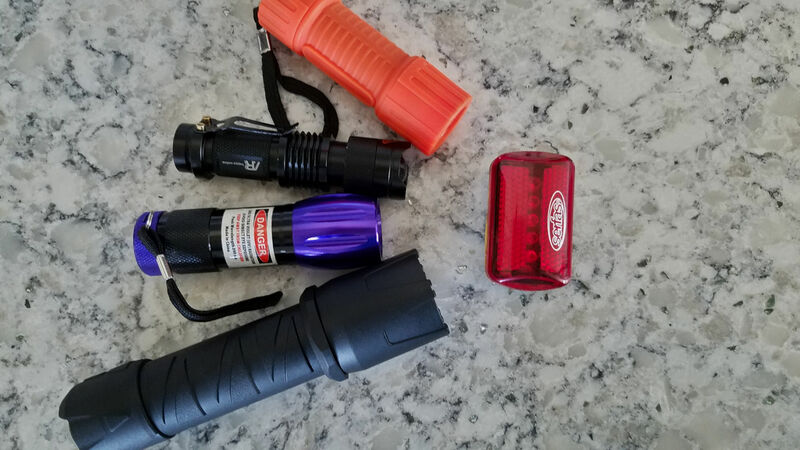 We brought many sizes and color lights for the hike. I recommend a red light. It keeps your eyes adjusted. When someone in front of us turned on their white light, it would blind us. We also brought a black light to see scorpions but it must have been too cold because we did not see any. The trail is NOT suitable for strollers or walkers. No pets. Depending on the time of year, hikers should dress appropriately and wear trail shoes or hiking boots. Parts of the trail are rocky and uneven with occasional steep grades (elevation gain: 120 feet). There was a check-in area where we received our wrist bands. The Park Rangers introduced themselves and discussed emergency procedures should something happen. One Park Ranger walked in the front of the group and one Park Ranger was at the end of line making sure no one was left behind. 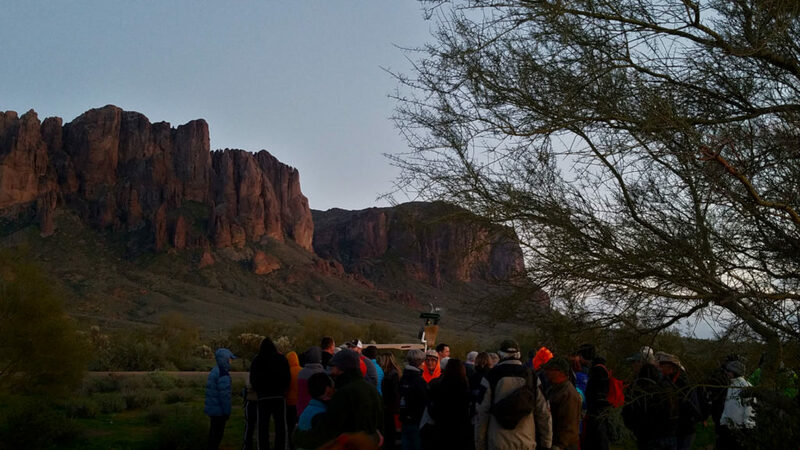 The hike was a guided 2.5-mile hike on Jacob’s Crosscut Trail at the base of the Superstition Mountains. 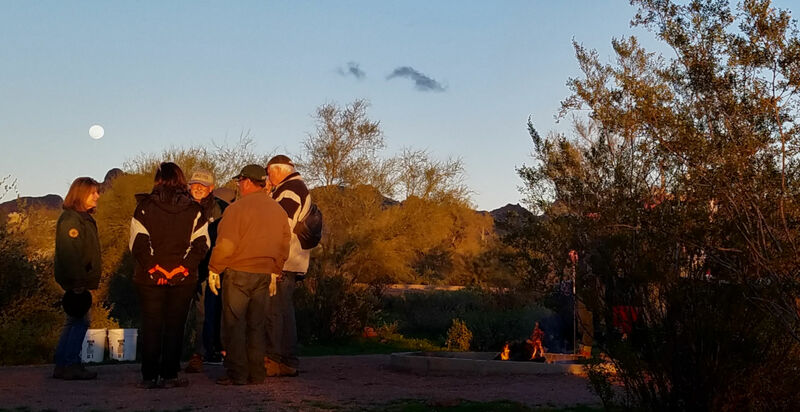 There were multiple breaks on the walk when the park ranger will share the history of the park, the legends of the Lost Dutchman and the legend of the Superstition Mountains, just to name a few. After the hike, we gathered around the campfire to roast marshmallows. 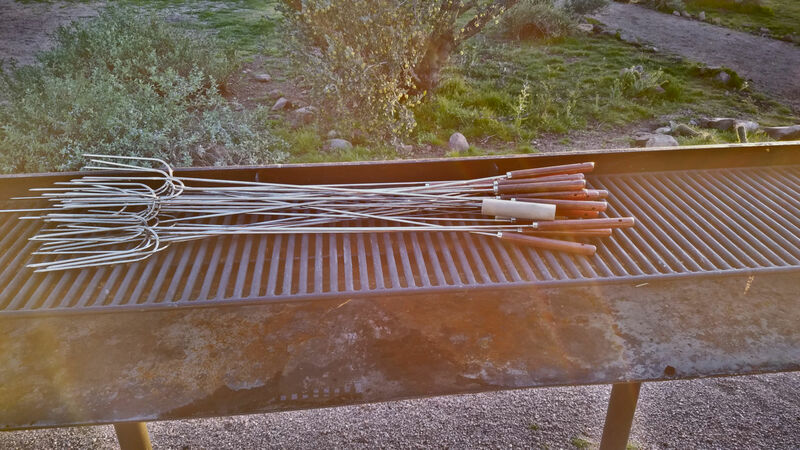 The marshmallows and sticks were provided. 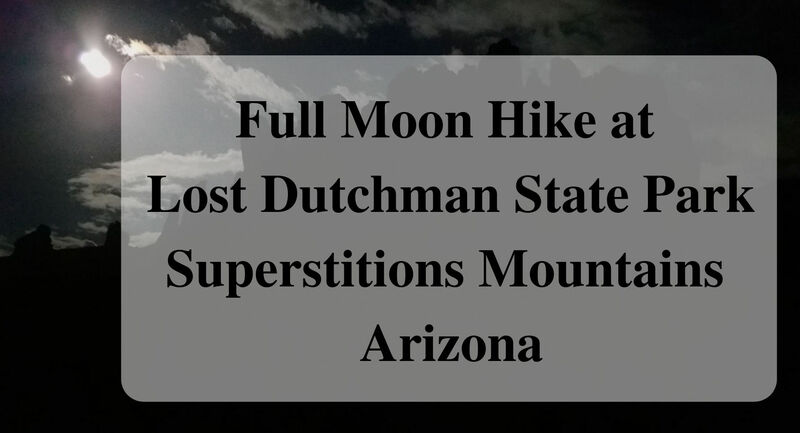 Have you been on a night hike during a full moon? We were so glad that you joined us. Looking forward to the next adventure. This looks so cool! My kids would love this, especially the oldest with all the enchanting legends and tales. I bet Arizona is so beautiful at night too. It is beautiful at night too. What a fun hike! 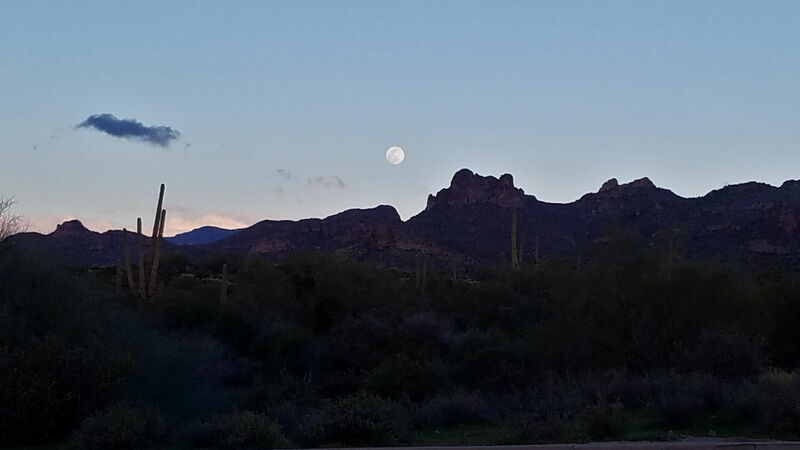 I’m thinking spring time is the best time to hike in Arizona! You are right, the springtime is the best. Wow! That looks scary and I love it. It was not scary at all. You would have a great time. What a fun way to experience that area! I love doing anything during a full moon. It makes it all the more magical. 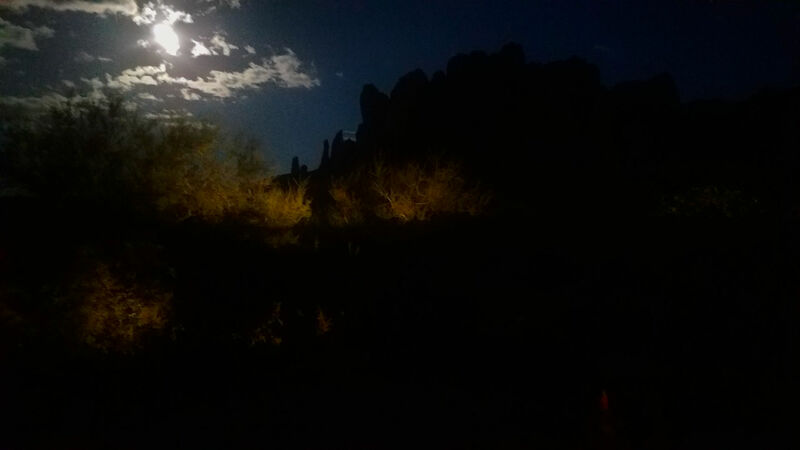 This full moon hike was magical. Looks fun! That’s cool they provided the marshmallows. Yum! Yes, very cool that they provided the marshmallows. Lots of chocolate for me too!! This looks very interesting. Definitely need good flashlights. I would like to try something like this in the future. The red flashlight would be best. I love camping when there is a full moon. So pretty and peaceful. Us too. Camping with a full moon makes night fishing fun. This looks like a lot of fun. I think I’d rather go in the spring or summer, but I’m a warm weather person. The spring or fall would be best. I want to do this!!!!! Bookmarking for future reference. You would have a wonderful time. Good info, thanks! Do you think a service dog would be ok? I see where it says no pets. That is a great question. I suggest when you call to order a ticket to ask the range that specific question. They will be able to help. Sounds like a fascinating adventure ~ memorable, for sure! I love night hikes! This looks so fun! Where was your favorite night hike at? What state?